To celebrate the site’s first anniversary I’m running a Freebie Friday every week this month, so readers can join the celebrations by winning some fabulous fashion and beauty prizes from some of my favourite brands. I’m a big fan of the smoky olive shades in the Riverside Park eyeshadow palette, which you can have a look at here, and I tipped their Liquid Lipshine as a holiday essential earlier this year. These glosses are the perfect products for autumn and winter too, as they don’t just look and feel great but help soothe dry and chapped lips while they’re at it. 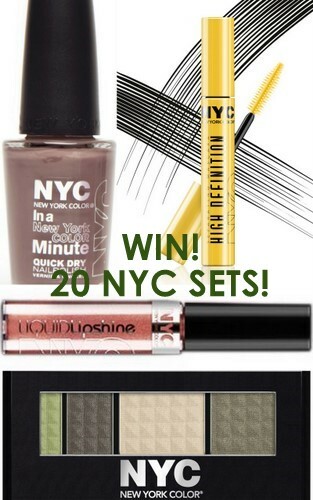 And you could be one of TWENTY readers to make over your makeup bag with Fluff and Fripperies and NYC! Win the perfect shades and products to update your look for autumn: my favourite Metro Quartet Eyeshadow in Riverside Park; In a New York Minute nail polish in Sidewalkers (very chic, and another personal favourite! ); High Definition Defining Mascara, and Liquid Lipshine in Brighton Peach Beach, a flattering suits-every-skintone type shade. Firstly, like the New York Color Facebook page here. The giveaway will close at midnight on Thursday 20th October, and winners will be chosen and announced on Friday 21st. Good luck! This giveaway is only eligible for Irish & UK residents who are following Fluff and Fripperies through Google Friend Connect (hit the Join This Site button to the right there, under the Facebook box!). But don't despair if you live elsewhere, as I'm also running an international giveaway that you can enter here. Marie Parton on FB - mariekparton@yahoo.com is how to get hold of me!! Clare Daly on FB, cdalyirl@yahoo.com email ! Have liked, shared and tweeted!! Liked, posted, shared and tweeted! Julia Cashman on FB and email is julsathome@hotmail.com! Thanks for a great competition! Hi Emma, make sure you check out NCItv on facebook/youtube. The first two trailers are up! Not on twitter but would love to win something for once!!! Diane Ayres. Have emailed you my addy. Great giveaway Emma, I love NYC and YAY! for them launching in Penneys. I'm still working my way through a ton of NYC stuff so I'll sit this one out. Great giveaway. Thanks for reviewing and offering. Have liked and shared on FB. Love the colours, great giveaway. Great giveaway, have liked and shared on Facebook. Tweeted too. Will email details now. I have liked and shared your Facebook post and am now tweeting details! liked, followed, shared and tweeted!!! 1. Liked - New York Color F/B page. 2. Liked and shared the post about this giveaway on the Fluff and Fripperies page. A M A Z I N G giveaway thank you ! !